Programming for Complex Tools Modern Machine Shop 65 are medical implants. Both of these latter types of parts have the advantage that they likely already are being produced on five-axis machines. "We recently assisted a company machining a titanium knee component," he says. "It was already five-axis, but the finish- milling cycle was 70 minutes. Circle-segment tooling reduced this to 10 minutes and deliv- ered an even better surface." Ballnose tools remain important. Frequently, complex parts have hard-to-access features for which only a ballnose can do the machining at the restricted angle that the part itself makes possible. Indeed, Mr. Trinque says this point suggests one of the main challenges and mindset changes he sees related to the adoption of the newer tooling. "Companies that have heard of the effectiveness of circle-segment tools often want to apply them to everything," he says, but these tools have limitations. In general, they are no good for roughing, he points out. Each of the specific tools has advan- tages and an application range of its own. Their different uses poten- tially expand the options available to the programmer, but in the same way, they change the importance of the decisions the programmer makes in realizing a productive process. "In the past, you might have used just one tool to finish a cavity," he says. "Now, including circle-segment tools might mean you think about that same cavity in terms of four different tool paths for four different tools that each do some different region of that cavity productively." Increasingly, this is how die/ mold programmers will need to think, Mr. Trinque says. 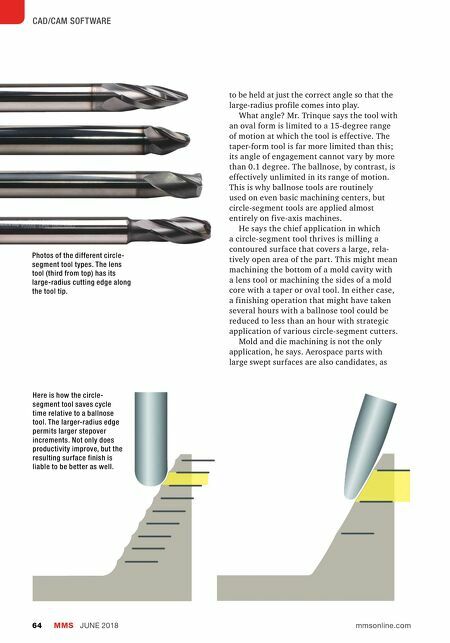 In his view, cutting tools offering complex profiles are the future. In machining contoured forms, they are the final piece bringing together the sophistication CAM software can realize with the complexity five-axis machining can achieve. 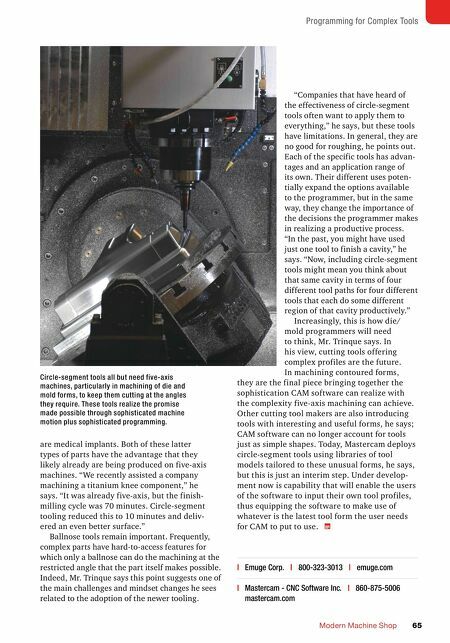 Other cutting tool makers are also introducing tools with interesting and useful forms, he says; CAM software can no longer account for tools just as simple shapes. Today, Mastercam deploys circle-segment tools using libraries of tool models tailored to these unusual forms, he says, but this is just an interim step. Under develop- ment now is capability that will enable the users of the software to input their own tool profiles, thus equipping the software to make use of whatever is the latest tool form the user needs for CAM to put to use. | Emuge Corp. | 800-323-3013 | emuge.com | Mastercam - CNC Software Inc. | 860-875-5006 mastercam.com Circle-segment tools all but need five-axis machines, particularly in machining of die and mold forms, to keep them cutting at the angles they require. These tools realize the promise made possible through sophisticated machine motion plus sophisticated programming.